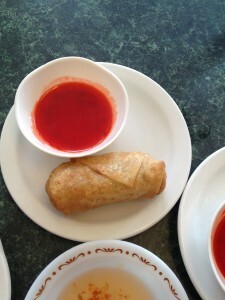 This week we are changing it up a bit and eating at some Asian restaurants. 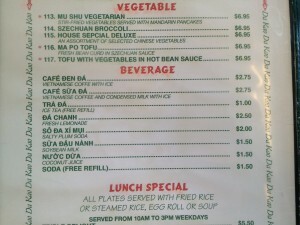 Today we ate at Da Kao. 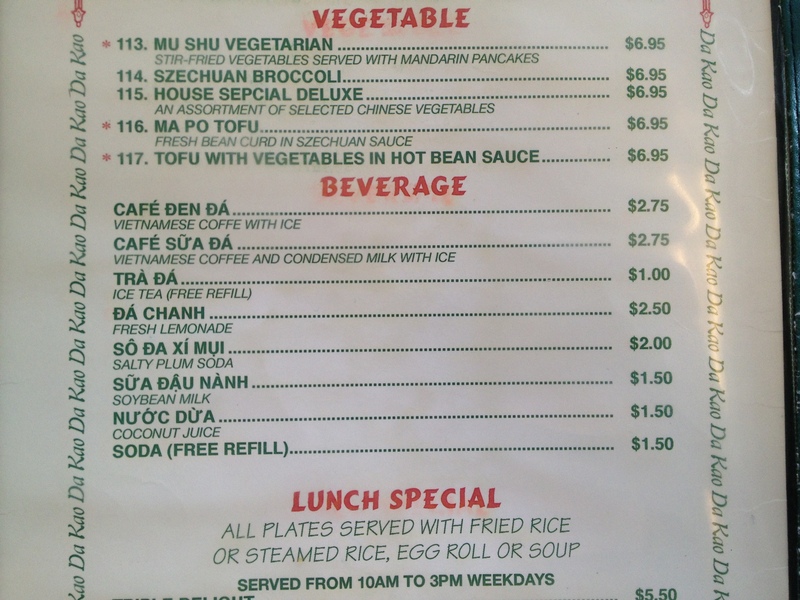 It is a Vietnamese restaurant and I was very sketched out when I first arrived because I had no idea what to expect. 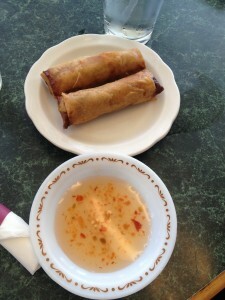 I have never had Vietnamese food before and honestly I had no idea what it consisted of. 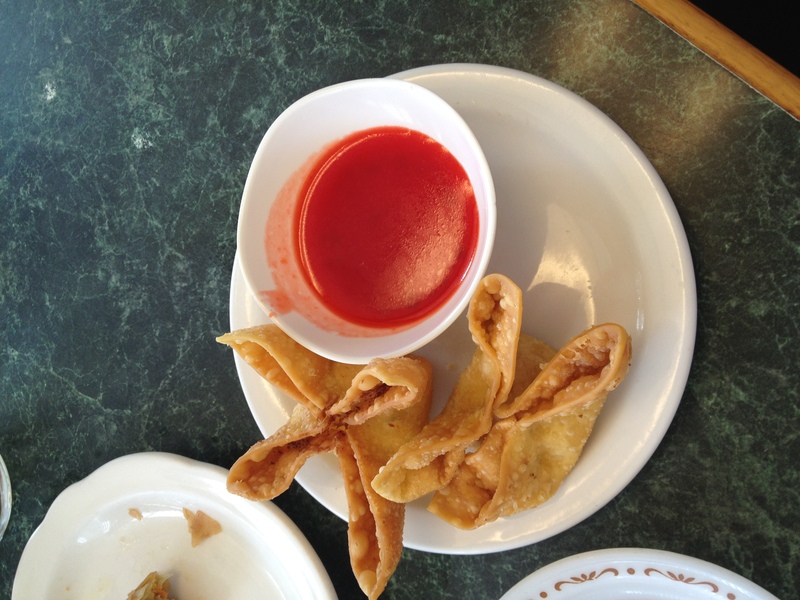 I know some typical Chinese food and that’s about as Asian as my taste buds have expanded. 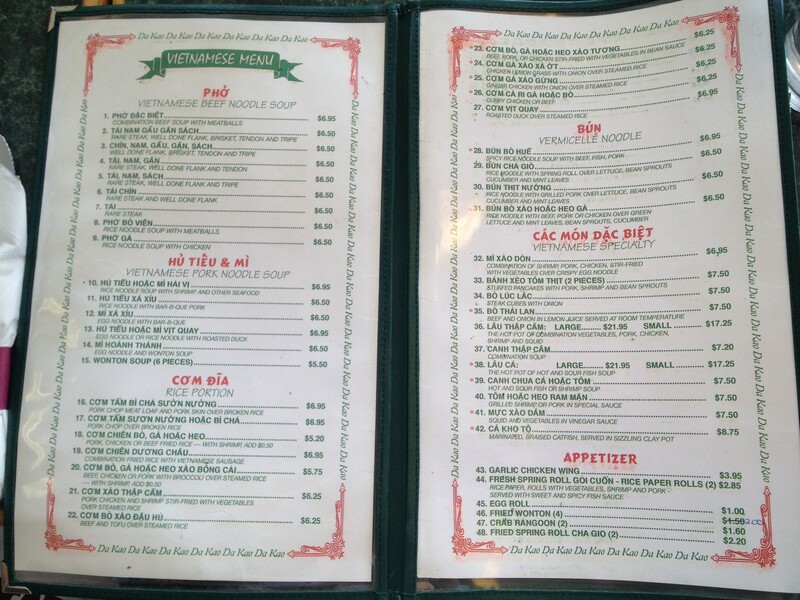 Vietnamese was a whole knew territory and trying to read the menu was the hardest part. 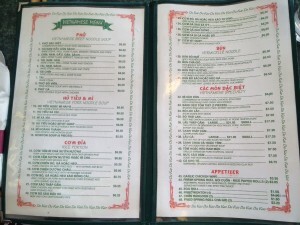 I could not even pronounce one of the words on that menu, if you would even consider them to be words. I was thankful there was a little English brief description below it, but when I ordered my food I still just pointed to what I wanted. A girl at my work told me to try the Phó. I had no idea what she was talking about but I trusted her and went for it. The definition the menu gave me was “Vietnamese beef noodle soup.” I am very picky with my meat so I had to stick with chicken, it was number 9 called Phó Gà. 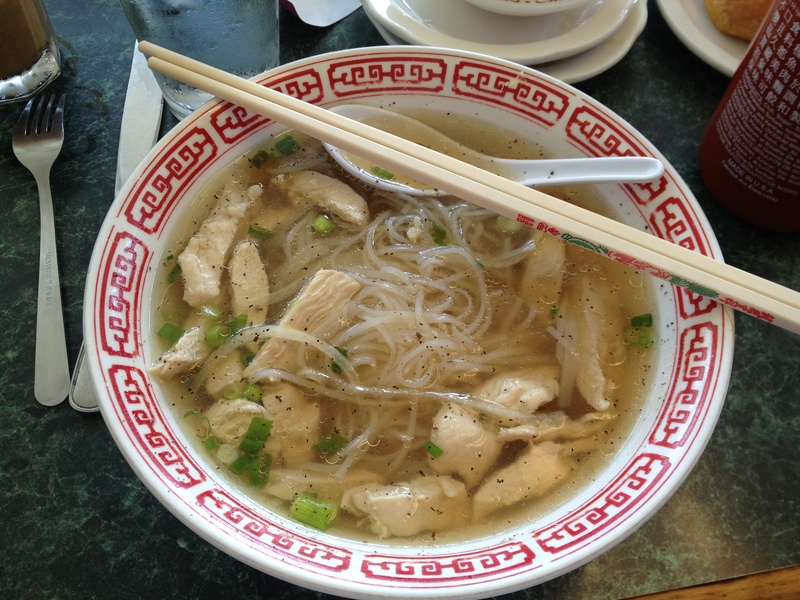 This was good; it didn’t do anything special for me just because it was only chicken, noodles, and broth. Don’t get me wrong it was good, but nothing that wowed me. 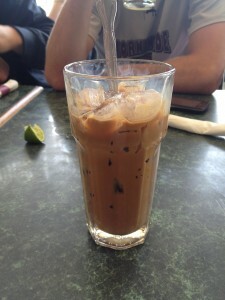 I also ordered Café Sũa Đá, this is Vietnamese coffee and condensed milk with ice. Honestly if anyone likes coffee taste I would definitely encourage them to try this. It was very good. At first I thought there was way too much ice because it had more ice then the drink, but then when I tasted it I realized how strong it was. So once the ice melted a little bit it was amazing. Cory and I split four different appetizers. They were all small so we figured we might as well split and try a majority. We shared the egg rolls, fried wonton, crap Rangoon, and fried spring rolls Cha Gio. I’m glad we shared because we got to experience a little of everything. 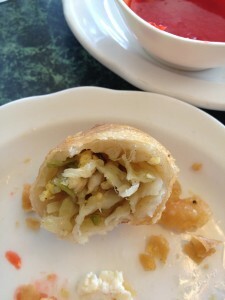 The egg roll was good, nothing too different from ones I’ve had in the past. I have never had a fried wonton before, and I didn’t want to know what was in it until after I ate them. Whatever was inside of it was dark, and I knew it would have an affect on me finishing them. I later found out it was just pork so it was okay. They were good, but they were a bit chewy and not my first pick. 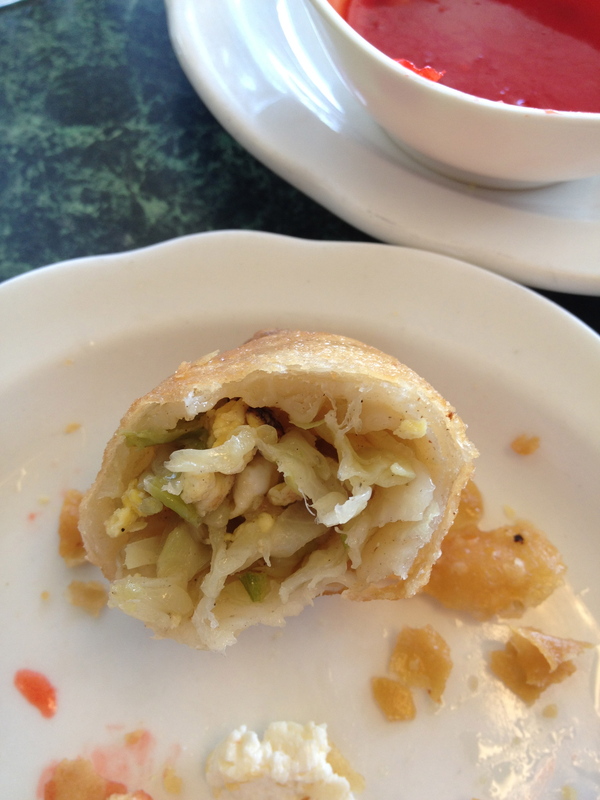 The fried spring roll surprised me, it was better than expected but did kind of resemble the egg roll. 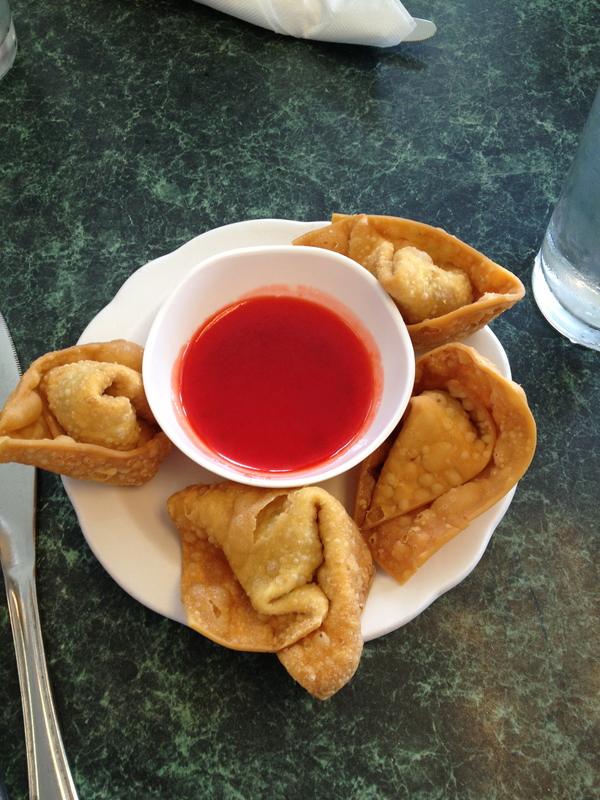 As always the crab Rangoon was my favorite. One of the best ones I’ve had. My overall experience was decent. It was kind of hard to communicate with the employees, but they tried their best. I’m not sure if I will return. I prefer a little more traditional food.